December is going pretty okay for anyone hoping to save a little holiday money by enjoying free or cheap food. Between a $2 unlimited Frosty key tag at Wendy's and $1 Long Island Iced Teas at Applebee's, you could go on a very unhealthy -- but cheap -- liquid diet. However, thanks to a promotion on the Wendy's app, you can snag a free burger or chicken sandwich as well. (It would be a nice addition to that liquid diet. You need to eat solid food. It's not good to subsist solely on Frostys and Long Island Iced Teas.) 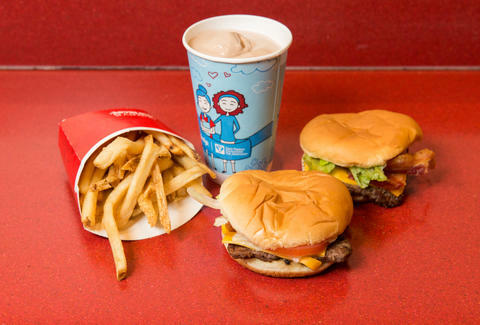 To be rolling in free burgers... er... a single free burger, all you have to do is download the Wendy's app. After you sign up, go to your Account page. Then click "Offers." Then, boom, burgers. Two of the available offers are for buy-one-get-one spicy chicken sandwiches and buy-one-get-one Dave's Single burgers. The perfect salads are packed with fresh ingredients. If that doesn't work for you because two burgers is a heavy lunch and you aren't sure your doctor would approve of you keeping one on your desk to have later at dinner, there's also a deal for $2 off any full-sized salad.